A sinister stranger takes no prisoners along the street of screams. After escaping from the Bennets' home, a badly injured Sylar looks for a way out of Texas. 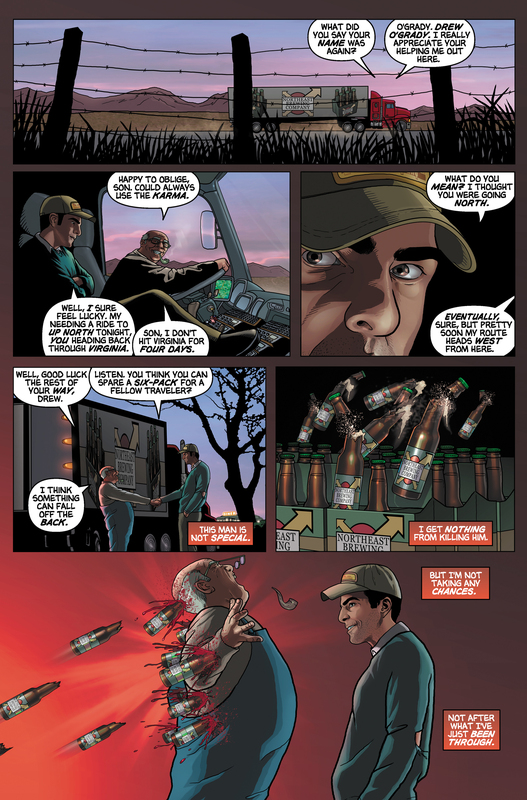 He hitches a ride with a trucker, but when he realizes the man isn't going to Virginia, he uses his telekinesis to kill the man with beer bottles. 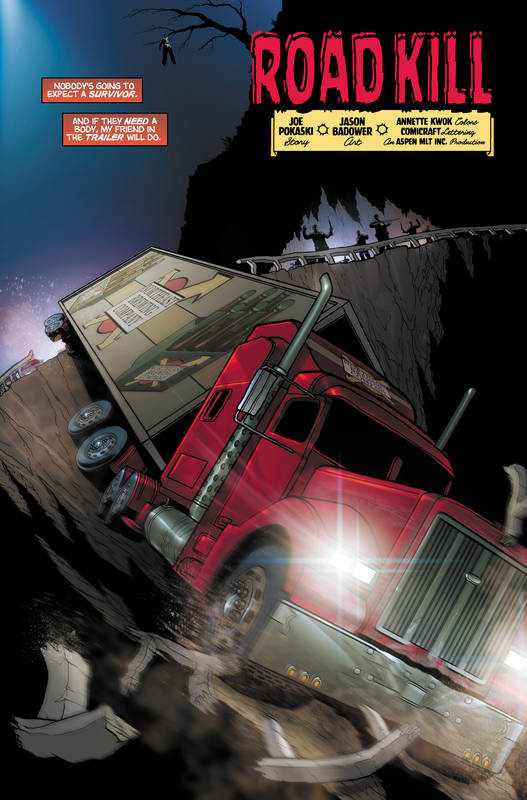 After rapidly absorbing the truck's operation manual using his enhanced memory, Sylar drives the truck to Virginia Beach, VA. 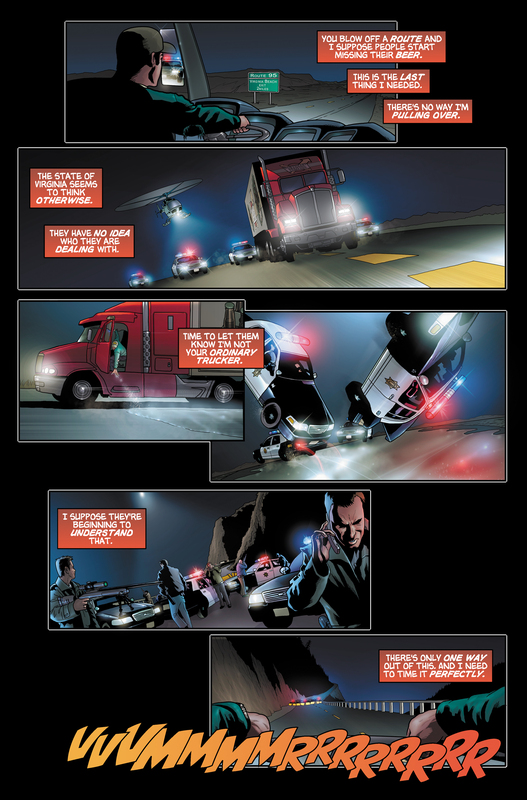 In Virginia, police attempt to pull him over, but Sylar freezes the roadway, causing the pursuing vehicles to wreck. 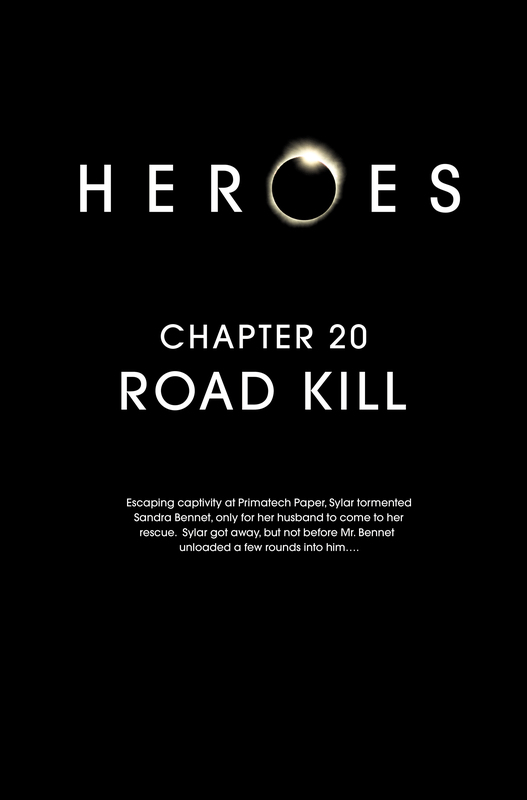 At a police roadblock, Sylar sends the truck off the side of the mountain road, leaping to safety in a nearby tree at the last moment. In Virginia Beach, Sylar approaches the home of the last name he remembers from Chandra Suresh's original map: that of Zane Taylor. Just as he's wondering how he'll find new victims, Zane answers the door, calling him "Dr. Suresh" — and Sylar has his answer. Sylar introduces himself to the trucker as "Drew O'Grady". He probably created the alias from two headlines in a newspaper he saw shortly before meeting the trucker. 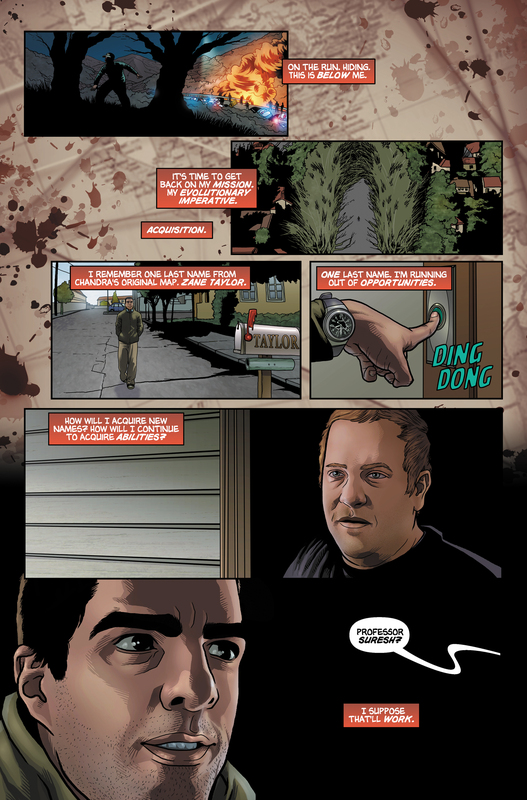 The headlines read, "President drew fire for welfare comments" and "O'Grady Farm to be purchased back..."
Road Kill is the first graphic novel to feature examples of more than two powers; Sylar uses his enhanced memory, freezing, and telekinesis. Additionally, the effects of Zane's melting can be seen on the mailbox at his house. The "Northeast Brewing Company" abbreviates to "NBC". Artist Jason Badower said NBC was very specific about the name they wanted for the trucking company. Jason didn't realize the abbreviation while creating the novel; had he picked up on it, he would have designed a different logo. When Sylar narrates his story, his words are denoted by red boxes instead of the traditional white boxes. This is consistent with his narrations in Turning Point. This graphic novel lays to rest the popular fan theory that Sylar was unable to take Charlie's ability due to the blood clot in her brain. 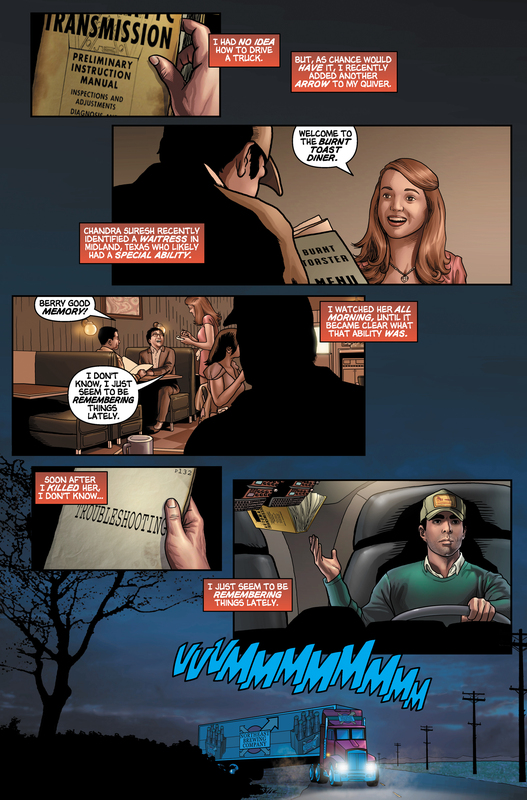 This graphic novel tells what happened to Sylar between the episodes Distractions (when he is shot by Mr. Bennet) and Run! (when he meets Zane Taylor). 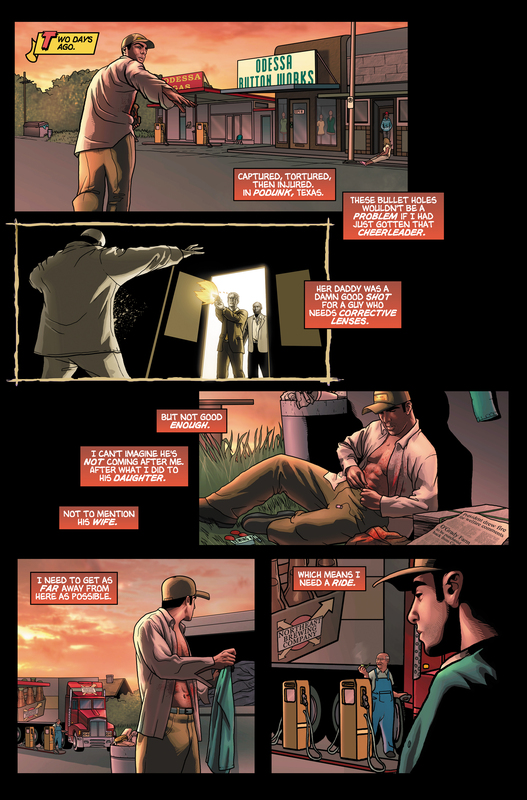 As of Once Upon a Time in Texas, Sylar never acquired enhanced memory in the new timeline in which Charlie is saved by Hiro. It is unclear how the events depicted in this graphic novel would occur in this new timeline. For images from Road Kill, see images from Road Kill. For the transcript from Road Kill, see the Road Kill transcript. For Jason Badower's original art from Road Kill and notes about his work, see here. This page was last modified on 22 October 2015, at 18:23.